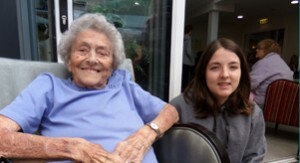 Resident Joan Cave recently celebrated her 95th birthday at Wentworth Court. Joan enjoyed a special birthday cake made by our chefs, Sue and Andrea. Born in Gloucester in 1920, Joan has spent much of her life in Cheltenham, attending the Central School on Gloucester Road and finding her first job with the Cheltenham Traction Company which ran the trams in Cheltenham. Trained as a shorthand typist, Joan worked for a Foreign Office department – the forerunner to GCHQ – during the Second World War and managed a small team. Living on Dunalley Parade, the family home was bombed but Joan was kept safe by seeking refuge under the kitchen table! Joan has been married and widowed three times with her last wedding at the age of 70 to Richard Cave. Joan had three children with her first husband, two daughters and one son. She has three grandchildren – Anna, Jenna and Darryl, who has recently visited from his home in Sweden.